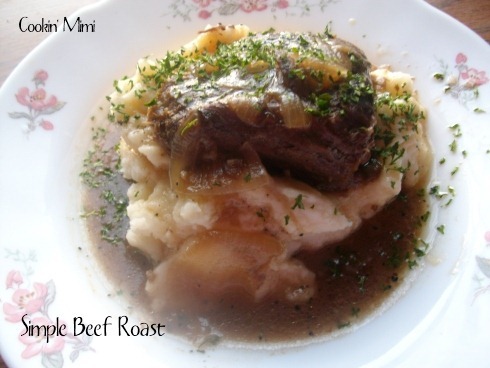 This is one of my absolute favorite ways to cook a beef roast in the slow cooker. The seasonings are kept pretty basic so the leftovers can be used in a variety of dishes without any worry. 2 cups beef broth. Low sodium is best. Heat oil in a skillet over medium heat. Sprinkle salt and pepper on all sides of roast. Add to the hot skillet and brown on all sides. Place onion and garlic in the bottom of slow cooker. Top with meat and pour beef broth over all. Cook on low for about eight hours until very tender. Skim fat from juices and serve with beef. Looks yummy! I think I have a roast in the freezer. Must dig it out! I can just imagine how amazing this smell while it cooks all day.